The Advanced Diploma in Business Administration (Marketing and Sales Management) aims to equip students with the knowledge and skills of Marketing and Sales Management so that they can be effective in meeting the demands and challenges of the marketplace, as well as to provide an avenue for participants to further their marketing education with professional marketing bodies and overseas universities and, where possible, to complete them in a shorter time. Upon completion of the Advanced Diploma in Business Administration (Marketing and Sales Management), students will be eligible for entry into the final year of the Bachelor of Arts (Honours) Business Management (Top Up) (Various specialisations available) programme offered by the University of Greenwich or the Bachelor of Arts (Honours) in International Business Management (Top Up) programme offered by the University of Wolverhampton. Students undertaking the Advanced Diploma in Business Administration (Marketing and Sales Management) programme will be expected to complete 15 modules of academic study over 8 semesters. This programme is available in full and part time modes, and will take 20 months to complete. Full-time students will attend classes 5 days a week on weekdays, while part-time students will attend classes 3 times a week on weekdays and/or on weekends. Building brand equity is the focus of leading companies whose brands are leaders in their respective industries, segments and markets. This module will expose the student to the concept of branding and offer students in-sights to the learning of brand management within the context of marketing mix from a global perspective. The course provides students with a valuable perspective, and a common denominator to interpret the potential effects and trade-offs of various strategies and tactics for building brands. Sales Management is an essential part of any companies selling process. This course places emphasis on major aspects of selling and sales management whilst also covering how marketing mix influence sales. Students will be exposed to various factors in creating a good sales environment and how to manage it effectively. The course will also examine the use of technology in sales and how it is related to sales strategic thinking. This course enables students to acquire the skills needed to understand and analyze the consumer mindset so that effective marketing strategies can be developed. Students are equipped with the theoretical and conceptual knowledge of the various psychological, social and cultural processes that impact upon how consumers select, purchase, use and dispose of consumer goods and services. This module covers the essentials and basic to global marketing focusing on elements of external environment influences and company global competitive advantage from the perspective of segmentations, branding and positioning. The module is designed as a foundation programme to allow students to have a good overview of what global companies are doing in the competitive world economy of international marketing. This module focuses on the key business communication skills necessary for effective and efficient operations in today’s complex business environment. Students will be introduced to basic communication concepts and principles, and will develop an understanding of the importance of both verbal and non-verbal communication skills. Students will have opportunities to apply their newly acquired communication skills in small and larger group settings and in creating effective documents appropriate to different business contexts. This module explores the processes and functions of management. Students will be given the opportunity to explore traditional and modern management theories and the Planning, Organisation, Leadership and Control (POLC) approach to management. The module will promote an understanding of management from a holistic perspective and will examine local, international and global management practices. In tod In today’s complex economic & social environments, it is important to manage human resources well in order to build an enriching work environment and an effective and organization. This course provides the basic concepts of human resource management that are useful all employees and managers. This course aims to provide students with a solid foundation in the dynamic and growing field of accounting. Students will be introduced to the double-entry bookkeeping and the process of completing the Accounting cycle. Cash, Receivables, Inventory system, and Fixed Assets will be discussed in details in this course. This m This is an introductory course of corporate finance. Students who aim to have some knowledge in financial management will learn some basic concepts of investment decisions and financing decisions. Acquiring the right decisions today will determine the success of the business in the future. The students will also be introduced to some market players and various types of financial instruments. Furthermore, how to estimate the intrinsic value of the financial instruments will be another challenging part of the course. This module will introduce students to key basic concepts in marketing and will focus on critical competitive strategies for generating and meeting customer satisfaction. Additionally, the module will focus on the activities used to implement marketing strategies created to meet customer needs and expectations. Marketing is one of key business functions in all companies. Understanding the basic concept of marketing is essential in any business studies. This module will cover all the essential fundamentals of marketing principles and allow students to be exposed to modern marketing concepts, terminologies and theories as a foundation for future applications in marketing in a globalised business environment. This module enables students to understand and acquire basic customer service skills that are necessary for the promotion of customer satisfaction. The course promotes competency in terms of information exchange, active listening, relationship building, complaint handling, meeting customer expectations and promoting loyalty through ongoing classroom activities and discussions. This course covers customer relationship management (CRM) and customer driven, market–based management practices that assist an organisation in attracting customers whilst sustaining profitability. Students will learn the skills to utilise CRM more accurately in evaluating the market place; evaluate competitors and determining the lifetime value of the customer. T This course provides students with a general knowledge of the basic microeconomics principles and macroeconomics policies and to relate these to the major economic institutions that forms the backbone of a country’s enterprise system. It helps students gain a better understanding and the ability to analyze important microeconomics and macroeconomics matters that affect their daily lives. Principles of Economics will serve as an important step toward a student’s plan for advance study in Economics. This module is designed to provide students with an appreciation and understanding of business ethics and corporate social responsibility. From the time the Enron Corporation collapsed in 2001, business ethics, corporate governance and corporate social responsibility has seldom strayed from the front pages of the press. The aim of this subject is to ensure students incorporate an ethical framework when making responsible business decisions. Students who master the knowledge and skill of integrating business ethics into their decision making will find this subject very useful for future growth of their respective organisations. This module aims to develop a project concept, partnership and plan. Students will work with a designated lecturer to supervise them during the process of doing this project. The project undertaken is with an industry partner. Project students are expected to utilize their learning throughout the course of core units and specialization. By the end of this module, students will be able to identify issues, propose solutions, utilize skills developed during the whole program and inter-disciplinary teamwork. The students will learn to present and advocate, in written and oral formats, a project concept and plan for development and production. In addition, they will learn how to evaluate challenges affecting practical implementation of their learning. Intakes for the Advanced Diploma in Business Administration (Marketing and Sales Management) programmes are available 5 times a year. All applications should be submitted to ERCI no later than 1 month before the commencement date. Courses are assessed by a combination of coursework, practical assignments and examinations. Unless otherwise stated, all modules within the Advanced Diploma in Business Administration (Marketing and Sales Management) programme are assessed based on the 3-3-4 framework: 30% on examination, 30% on individual assignment(s) and/or class tests, 40% on group assignment(s) and/or class participation. 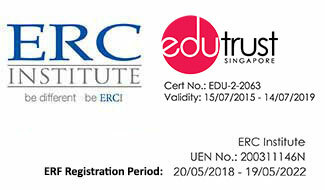 ERCI Foundation Certificate in Business Administration / NITEC Qualification. A minimum of Year 12 Studies or equivalent. Students must pass all prescribed modules in the Advanced Diploma programme with a minimum grade of P (Pass).